Each week Classic Rock 101.5 has your chance to win tickets to Nebraska’s hottest concerts, Blur Party Husker Tailgates, and cool tri city events. Listen every Thursday after the Bob & Tom Show for your chance to win. We’ll also announce the winners on Thursday afternoon. Classic Rock 101.5 giveaways have included tickets to Rod Stewart, Santana, Boston, The Doobie Brothers, Styx, Jim Gaffigan George Thorogood, Heart, Steve Miller Band, Lynyrd Skynyrd, Alice Cooper, Rob Zombie, Larry The Cable Guy, Ted Nugent and REO Speedwagon, Foreigner ZZ Top, Peter Frampton Def Leppard, Guess Who and more! Tailgate Passes to Husker home games with Blur Parties. Plus tickets to your favorite local events. Occasionally Classic Rock 101.5 will Supersize the ticket giveaway with tickets each day ALL WEEK LONG. 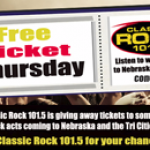 Listen to Classic Rock 101.5 every Thursday for your chance to win!